Two new schools have joined the Fiji Sec­ondary School Rugby League West One competition which kicks off at Garvey Park, Tavua today. The schools are St. Francis College in Nakoro­tubu in Ra and Ba Sangam College. Zone coordinator Cabealawa Kotoimakogai said they were delighted to have more schools joining the competition. “The competition this season will be exciting as we will look forward to a good performance from the talented students who are eager to play,” Kotoimakogai said. Queen Victoria School U19 side is adamant of a positive result against Ratu Sukuna Memori­al School as they battle for the Vodafone Tanoa Challenge in group two of the South Eastern Zone competition. Head coach Jo Savou believes RSMS will be tough having players who participate in the Vodafone Cup competition in various clubs namely Nabua Broncos, Nadera Panthers and Kinoya Sea Eagles. “Our players are all playing in school level competition whereas RSMS have the advan­tage since they take part in the Vodafone Cup competition,” Savou said. “We respect them and one area we want to fo­cus on is to improve on our discipline. 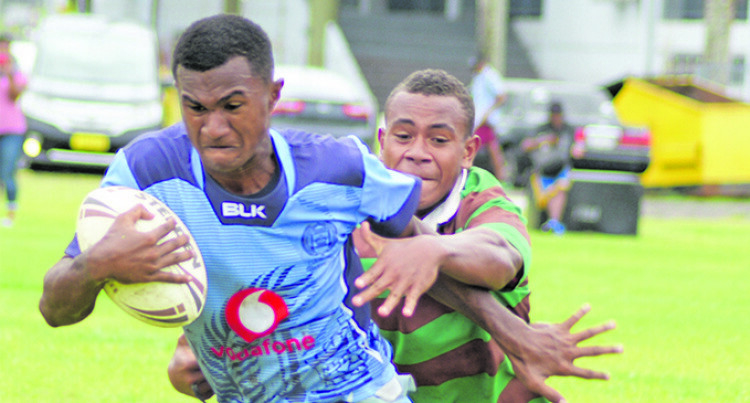 In other challenge defending champions Ratu Kadavulevu School U19 team plays Nasinu Sec­ondary School. Buckhurst G2; U15: 9am; RSC vs LDS; 10:05; MCI vs SMC, 11:20 U17; DHS vs RLC; 12:30pm; U17; NAS vs RSMS, 1:45 U19; JWC vs AOG, 3 U19; NAIT vs SHC.